The president has tried to reassure worried investors and land owners that land reform will be done in a rational way. 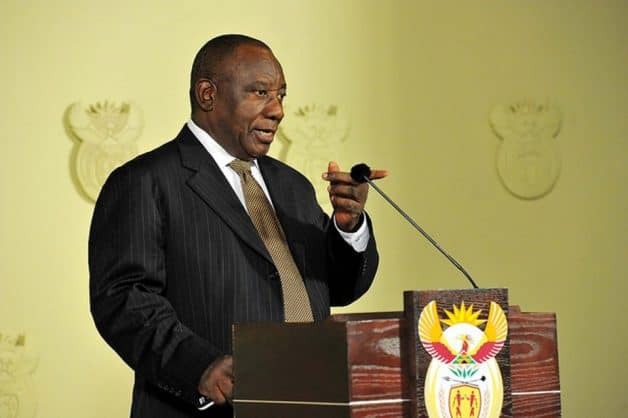 President Cyril Ramaphosa, speaking to the House of Traditional Leaders on Thursday, said that people should not panic about the fact that the constitution is likely to change to allow land expropriation without compensation. He had earlier reassured the traditional leaders that they continued to be taken seriously by government, were not considered “toothless bulldogs” and that their role in government underpinned the constitution as a corrective measure to address the sins of the past. Turning to the recent adoption of a motion brought by the EFF to change section 25 of the constitution to allow for land expropriation without compensation, Ramaphosa adopted a conciliatory tone. The ANC had overwhelmingly supported the motion in the National Assembly, which Ramaphosa described today as a necessary measure to deal with the “original sin” of land having been taken by the colonial and apartheid regimes from black people. He said this issue needed to be dealt with as a matter of restorative justice, but it would not be done in a damaging way, echoing his words from his state of the nation address. Land expropriation would not be a “smash and grab” attempt, and much consultation would take place to ensure the process would not harm food production, jobs and the economy as a whole. He pleaded with groups that have been trying to warn other countries and investors that property rights are under threat in South Africa not to panic and to spread fear, but to rather embrace the positive spirit of the legislative change, which he felt could still bring benefits to the country. The ANC elective conference last year adopted the policy of land expropriation without compensation as a non-negotiable principle that would allow for the more “radical economic transformation” of South Africa. ANC secretary-general Ace Magashule has also said in a press conference on Thursday that land reform needed to be carried out positively, in a way that rebuilt confidence in South Africa and created jobs. Opposition parties such as the DA and bodies such as AfriForum and Agri-SA have warned on the dangers of land grabs. The DA and other critics say land expropriation without compensation undermines property rights in South Africa. On Wednesday, Agri SA said politics and emotion had dominated Tuesday’s debate on land in the national assembly. “Rational arguments regarding the possible implications that such a step may hold for the agricultural sector and the broader economy were absent from the debate,” it said. Without loans, farmers could not purchase seed, fertiliser, feed or implements and would be unable to produce, it argued. The EFF has dismissed concerns about threats to food security as unfounded. The proposed amendment will now be referred to the Constitutional Review Committee which must report back to parliament by August 30.